Examples of Richardsonian Romanexque architecture found on Groton Bank. 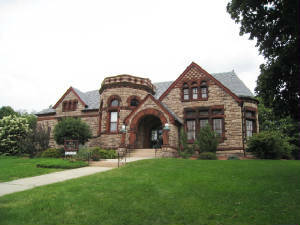 Dedicated in 1890 the Bill Memorial Library was the first public library in all of Groton. The original portion of the building is the front right portion with additons at the left and rear (not visible here) constructed in 1907. 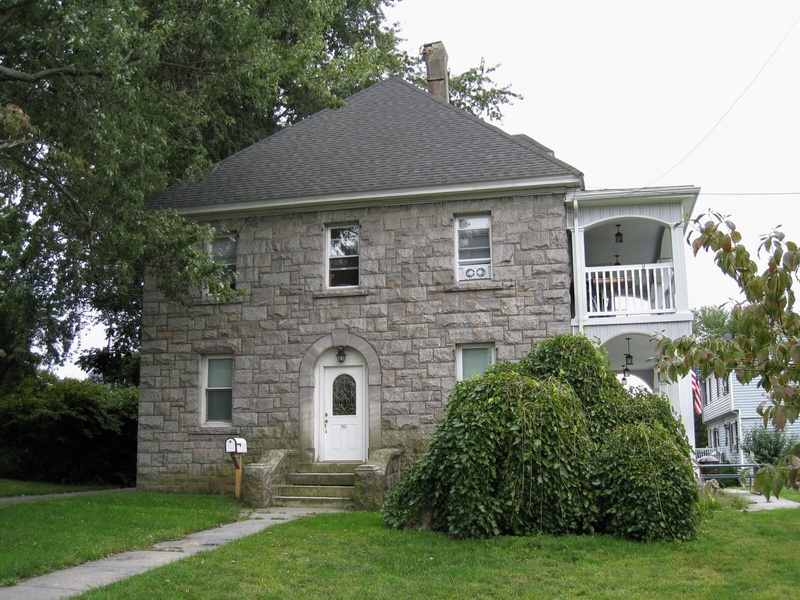 It is built of Stony Creek granite and trimmed with Maynard Freestone. The library was given by Frederic Bill to the community with a trust fund to support it and is one of the few community libraries still operating primarily on its trust fund. Frederic Bill, a local businessman, later made his fortune in New York, retired, came to Groton and became a local philanthropist. He also gave Bill Hall at Connecticut College (then Connecticut College for Women) in New London, CT, and was a major contributer to the constrution of new Groton Congregational Church built in 1902.